Shark Bay’s wildlife credentials make impressive reading. There are more than 10,000 dugongs, it is the best place in the world to see stromatolites, and the Monkey Mia wild dolphin experience is world-renowned. 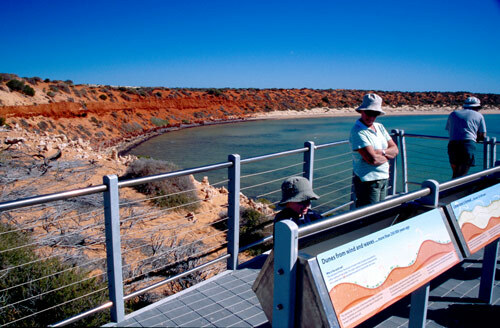 Shark Bay is also home to some of the Earth’s rarest mammals and is vital for conservation of many species. With time and patience you can have some exceptional wildlife encounters in Shark Bay. 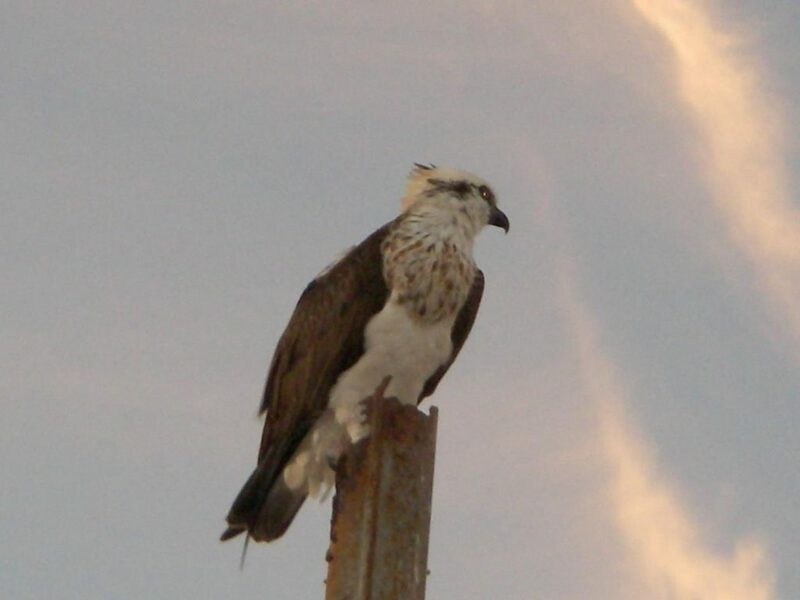 See the fact sheets page for detailed information about some of Shark Bay’s wildlife. Wild Indo-Pacific bottlenose dolphins visiting the beach are the main attraction at Monkey Mia. A little further offshore are dugongs, rays, turtles and other marine animals so a wildlife cruise is worthwhile. 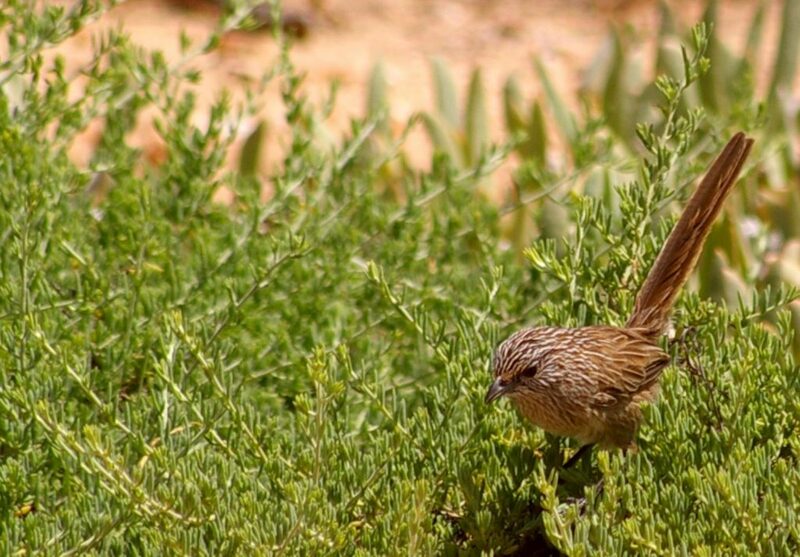 The walking trail around Monkey Mia is great for bird watching. 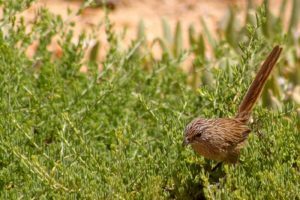 Look out for the thick-billed grasswren, white-browed babblers, chiming wedgebill, southern scrub-robin, and crested bellbird. In summer there are a variety of shorebirds on the mudflats along the coast south of Monkey Ma. Perched on top of the cliffs at Skipjack Point are two lookout platforms with views of marine wildlife in the clear water below. Rays, turtles, cormorants, sharks and schools of fish are common and you may also see dugongs and dolphins. The Wanamalu trail links Skipjack Point with Cape Peron giving you more chances to see wildlife, including cormorants on the beach at Cape Peron. Sharks, rays, schools of fish and dugongs can be seen from this perfectly placed boardwalk high above Henri Freycinet Harbour. 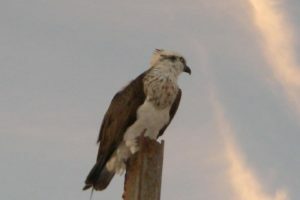 Offshore are two small islands that are home to rock parrots and breeding seabirds such as cormorants and silver gulls. The greatest concentration of wildlife is during summer as many species seek warmer waters further out during winter. Without leaving town you can see gulls, cormorants, wrens, ospreys, kestrels and emus. Please do not approach the emus or give them or other wildlife food as this can create problems. Denham is also home to many reptile species including bobtails (large skinks), monitors and thorny devils. Top bird watching sites include Francois Peron National Park for bush birds; Monkey Mia for small scrub birds; Little Lagoon for waders and shorebirds; Bush Bay and New Beach on the Wooramel Coast for mangrove species like the striated heron; and Hamelin Pool Telegraph Station for bush birds like the hooded robin and the chestnut-rumped thornbill. 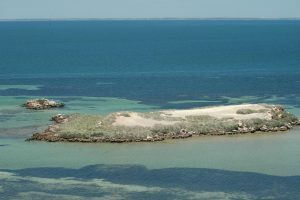 Areas in Shark Bay particularly important for seabirds and shorebirds include Faure Island, the eastern side of Dirk Hartog Island, Pelican Island and the spit on Salutation Island. 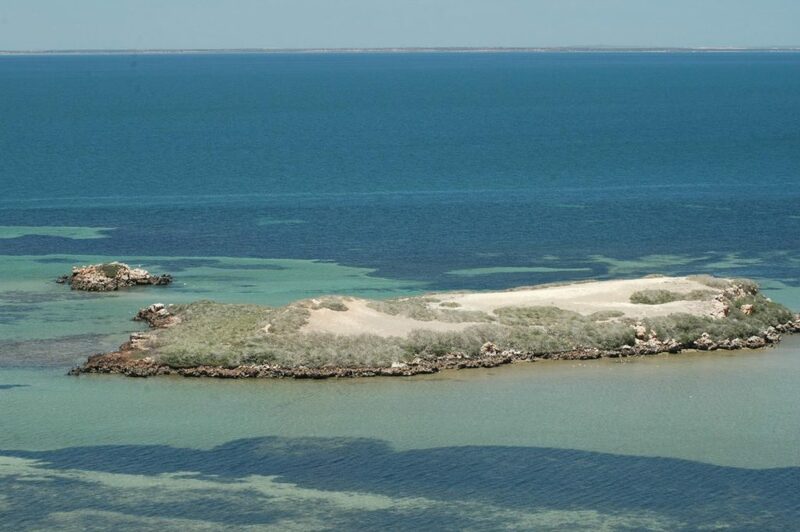 Faure and Pelican islands and flats around them may be the most important area for migratory shorebirds in Shark Bay. 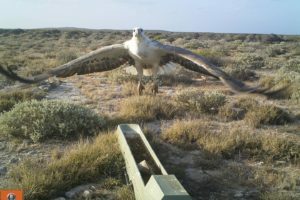 Most islands in Shark Bay host seabirds and 14 species are known to breed here, including the largest population of pied cormorants in Western Australia. Fairy terns nest on mainland beaches and spits. Another 50 seabird species visit the area. In winter 50 to 100 pairs of pelicans breed on Pelican Island, one of only 9 or 10 pelican breeding sites in Western Australia. Boats approaching within one kilometre of the island can disturb the birds. Shark Bay is internationally important for two species of shorebirds, the banded stilt and eastern curlew; and is nationally important for five species – the wood sandpiper, greenshank, grey plover, banded stilt and eastern curlew. The eastern curlew is the largest shorebird migrating to Australia and is considered rare in Western Australia with the Shark Bay population considered significant due to declining numbers elsewhere in Australia. A species list and a bird watching guide are available on the fact sheet page. Western Australia is renowned for its wildflowers and after good winter rains Shark Bay has spectacular displays. In coastal areas Shark Bay daisies creep over bushes and the Tamala Rose adds flashes of pink and red. The yellow tufts of acacias are littered throughout the shrubland and Eremophilas add red and mauve to the landscape. 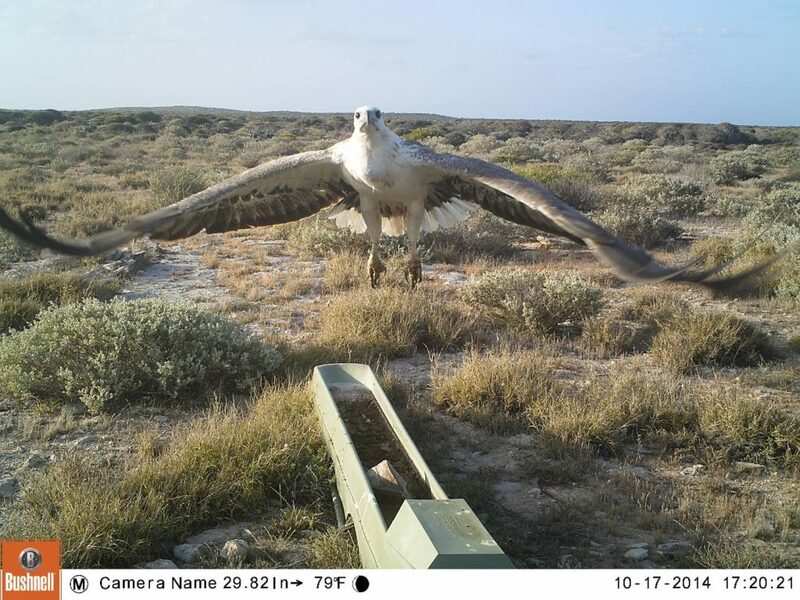 White bellied sea eagle in front of an automated camera on Dirk Hartog Island.